One important thing to consider is that the Church is a global institution with many hierarchical layers. Beyond pay, there has been some recent discussion about the possibility of female cardinals and deaconesses (1, 2, 3, 4). In the here and now, Michael O'Loughlin over at Crux recently looked at the number of women in high-level U.S. diocesan positions. In this post, I’ll address what is happening at the parish-level in the United States with an emphasis on pay. First it is important to set a benchmark. 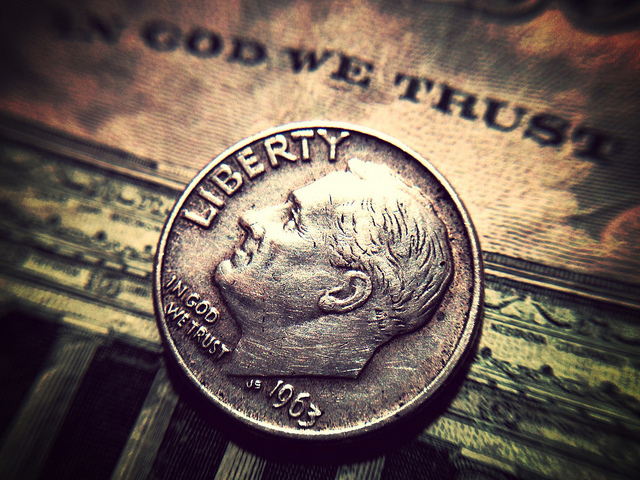 For example, the gender pay gap within the White House is 12 cents. Men earn an average of $88,600 per year and women $78,400. That means for every dollar men earn working for the Obama Administration, women earn 12 cents less. The gap at the White House is better than what the Administration says this is for women nationally where for every dollar earned by men, women earn 23 cents less. The Pew Research Center disagrees with the White House math and instead estimates that women earn 16 cents less per dollar than men nationally (down from 36 cents in 1980). The best data CARA has on pay within parishes was collected in a national survey in the fall 2010 and published in 2011 by The National Association of Church Personnel Administrators (NACPA) as part of the Emerging Models of Pastoral Leadership project. The survey included information on 5,701 persons working in parishes in ministry and non-ministry positions in 433 randomly selected parishes. The data summarized below includes only those being paid. Parishes often rely on significant numbers of volunteers for some of its ministries (about 37 percent of those working in parishes volunteer and 59 percent of volunteers are men—many of them permanent deacons). Overall, when one includes all paid staff including clergy, vowed religious, and other lay persons, women earn 11 cents less than men per dollar earned (or $2,560 fewer dollars per year). Although a gap still exists, the situation in the Church is apparently better than in the White House or the country as a whole. 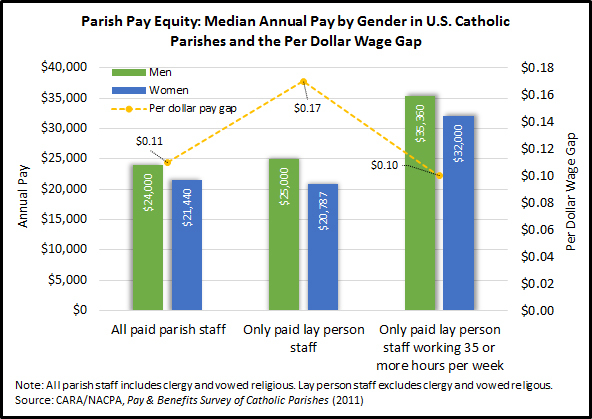 When one excludes clergy and religious sisters or brothers working in parishes the gap increases to 17 cents per dollar (note: pastors typically earn among the lowest wages in the parish at $12.90 per hour, although they do receive the benefits of free room and board). However, this includes many positions that are part-time or per service (e.g., musicians, groundskeeping). When one restricts the analysis further to lay persons working 35 or more hours per week the pay gap decreases to 10 cents per dollar. Note that CARA prefers to use medians for income rather than means. If we were to use average pay instead this pay gap would be even smaller at 8 cents per dollar. Many critics of the type of pay statistics discussed above note that these do not necessarily represent a measurement of “equal pay for equal work.” There are many different jobs aggregated in these data. Do women earn less than men doing the same type of work? It depends on the ministry or service being provided. 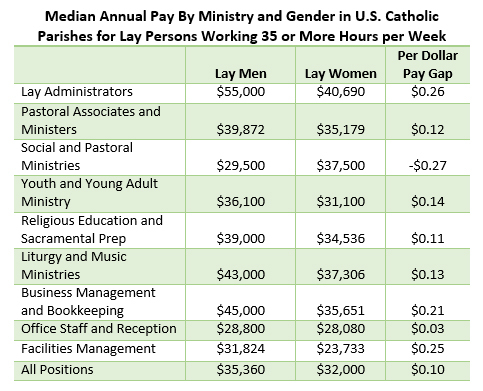 Among lay administrators (e.g., Parish life Coordinators, Parish Administrators, Pastoral Ministry Directors) the pay gap is bigger at 26 cents per dollar. Yet among those working in social or pastoral ministries (e.g., Family Life Directors, Pastoral Counselors, Parish Nurses, Senior Ministry Directors, Social Ministry Directors) the pay gap swings entirely in the other direction with men earning 27 cents less per dollar than women. There are also disparities among those working in facilities management (e.g., maintenance workers, custodians, cooks, housekeepers) and business management and bookkeeping (Business Managers, Bookkeepers, Account Clerks, Stewardship Coordinators) with women earning 25 cents and 21 cents less on the dollar, respectively. In nearly all other staff areas, pay gaps are much smaller—even down to 3 cents per dollar for general office staff and reception (e.g., Office Managers, Administrative Assistants, Secretaries, Receptionists). Pastoral Associates or Assistants serve as a chief assistant to the pastor in a parish, coordinating several parish activities and programs. Lay men serving in these positions earn a median annual wage of $42,500 compared to lay women who earn $36,823 representing a 13 cent wage gap per dollar. Youth Ministry Directors lead parish youth ministry programs including catechetics, spiritual formation, worship, leadership training, and service opportunities. Lay men serving in these positions earn a median annual wage of $37,224 compared to lay women who earn $32,000 representing a 14 cent wage gap per dollar. Catechetical Ministry Directors lead religious education programs including formation for adults, teens, and children. They supervise staff and volunteers in the program. Lay men serving in these positions earn a median annual wage of $39,936 compared to lay women who earn $38,444 representing a 4 cent wage gap per dollar. Music Directors plan and coordinate parish music often including several choirs and musician groups. They also supervise and train musicians and cantors and plan special music performances. Lay men serving in these positions earn a median annual wage of $40,000 compared to lay women who earn $39,690 representing a 1 cent wage gap per dollar. Bookkeepers maintain records for general ledger, subsidiary ledgers, payroll, accounts receivable, accounts payable and monitor current financial information for all funds. Lay men serving in these positions earn a median annual wage of $30,000 compared to lay women who earn $31,164 representing a -4 cent wage gap per dollar. CARA conducted a smaller national survey of 532 Catholic staff members in 246 randomly selected parishes in 2012. Among those paid, this study estimated a median salary for men of $32,000 and $31,000 for women representing only a 3 cent gender wage gap overall. Frank Bruni should know that the Catholic Church in the United States still has some work to do on pay equality but it is less work than many other American institutions—including the White House. Currency image courtesy of Vic. There you go again (1, 2, 3)... According to the Pew Research Center, "Catholics appear to be declining both as a percentage of the population and in absolute numbers" in the United States. But are Catholics disappearing anywhere else other than within in the walls of the Pew Research Center? 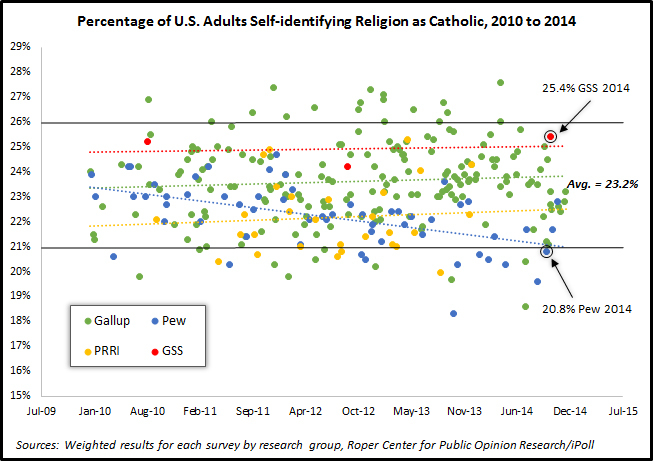 As shown in the figure above, the self-identified Catholic affiliation percentage since 2010 has mostly varied between 21% and 26% among surveys conducted by Gallup, Pew, PRRI (data are only available for analysis from 2010 to 2013), and the General Social Survey (GSS). The average of all these polls is 23.2%. This is generally consistent with a trend that began in the late 1940s in Gallup's surveys and has persisted through the GSS series that began in the early 1970s. The only series on the figure above that shows a downward trend (i.e., the dashed lines) is Pew's. The current study estimates that 20.8% of U.S. adults are Catholic. This is down from 23.9% in a similar study conducted by Pew in 2007. Pew is taking the difference between these two survey estimates quite literally; so much so that they have attempted to do a population trend analysis with just these two data points. It takes a special kind of hubris to treat survey data as if it were a census and declare a trend with an N of 2 (...knowing that this result was not generally evident in other polling, which is noted well after the declaration on page 115 in Appendix C of the report). This will either turn out to be a brilliant claim ("we said it first") or a bit of a blemish for survey research. Time will tell and to be honest it already has as the 2014 GSS came out of the field after Pew and that study estimated 25.4% of U.S. adults are Catholic. As the principal investigator for the GSS noted in the Wall Street Journal today, "There’s no hint of any decline." I've heard Pew researchers claim that the question wording they use allows people to be honest and more easily admit they have no religious affiliation (i.e., reducing social desirability bias). But I believe PRRI uses the same question and I don't see the same trend in their data that is evident in Pew's surveys (PRRI's American Values Atlas estimates that 23% of adults were Catholic in 2014). I don't think it's the question wording. The lower than average Catholic estimate in Pew's study could be a reflection of some sampling issue. As noted on page 71 of Pew's report, only 48% of Latino respondents self identified as Catholic in the study. Among the surveys (using bilingual or English and Spanish interviewers) shown in the figure above, the typical poll estimates a majority of Hispanic or Latino adults self-identify as Catholic. Accurately sampling and surveying Spanish-speaking Hispanics/Latinos in the United States is one of the more challenging tasks survey researchers have. CARA's meta-analysis of recent national surveys indicates this can often be the source of a survey estimate for Catholic affiliation "falling low" when aggregated with other studies. As I often tell my students at Georgetown, surveys are blurry portraits of reality. Treat them as such. There is always more to worry about than the margin of sampling error. Confidence intervals still exist even when you interview 35,000 people. And beyond that there are many potential error components that have nothing to do with chance. I have no doubt that the number of Americans who are religiously unaffiliated is rising. There are pieces of data that indicate to me that the Catholic affiliation percentage in the U.S. will fall in the future (...at the same time, the Catholic population will likely continue to grow). As a scientist I will always follow the data. But I am rarely convinced by a finding that is inconsistent with what most others are registering. I've read Pew's report. I'm generally a fan of their work. But I still feel I have no credible evidence that the Catholic population is declining in the United States. It is possible but not very likely. In other words, statistically speaking, don't bet on it.